The Fourth of July is always a great time to reflect on the day that our great nation gained independence. If you’re looking for the best ways to celebrate this holiday, Wisconsin has a wealth of activities and events to choose from! Show off your red, white, and blue, for the perfect Fourth of July in Wisconsin! Summerfest has been a Milwaukee tradition for over 50 years. While the music festival goes on for a couple of weeks, they always plan it within the Fourth of July. It’s the ideal place to spend the holiday. Listen to tons of local and big named bands, grab food from your favorite local food joint, and of course grab a refreshing Miller Lite. 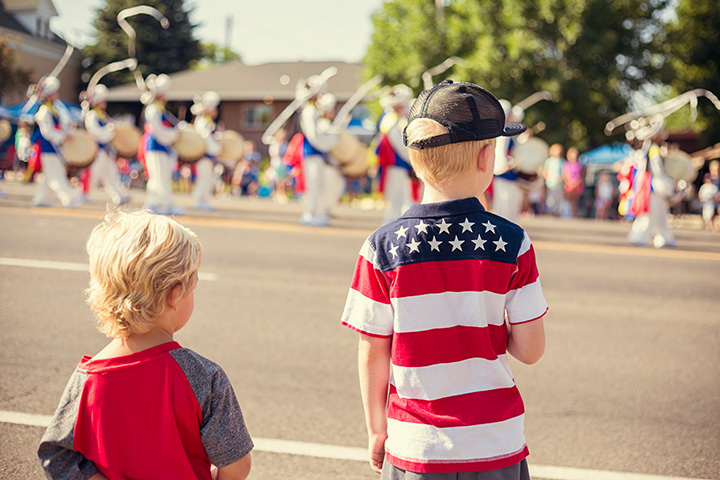 Year after year, the Eagle River Fourth of July parade grows a little bit larger. This year, there will be 80 different floats entered for their parade on Wall Street. Enjoy music courtesy of Skill Kicking, a beer garden for the adults, and tons of fun activities for the kids. Fireworks to happen at dusk! If you and your family vacationed to the Dells for the holiday weekend be sure to add the Wisconsin Dells Firework Extravaganza to your list. Fireworks will start at dusk and refreshments will be available for purchase. Grab your lawn chairs and some blankets and prepare to be wow’ed! Enjoy the Fourth of July for a daylong celebration in Green Bay, Wisconsin. There will be tons of entertainment, food, and drinks to make for a beautiful day celebrating our country. They even have special Waterboard Warriors Water Ski Show happening on the Fox River later in the afternoon. The Milwaukee Lakefront Firework show is one of the largest in the state. Technically the fireworks will light off on July 3 at 9 p.m. It will be a great place to get ready for the holiday spirit. Bring the kids and head down to the Veteran’s Park for a patriotic firework showing. Head over to the Monona Community Festival happening July 3 and 4. If you love food, you’ll love the Taste of the Fourth, where local business and food carts come together to bring you the best of the best. Other fun events are the Wisconsin Wife Carry, their art fair, and much more. Don’t forget about the traditional rides and carnival food and snacks we all love. Racine Fest is one of the largest festivals in the Midwest held on the Fourth of July. Take the family to the parade on Main Street. Have fun experience traditions like the Calliope and listening to great music. After the parade head to North Beach to claim your spot for their 40-minute firework exhibition. Pack up the family and head over Waunakee’s Ripp Park for WaunaBoom. Every year, the boom gets even bigger! Sign the family up for kick ball, listen to great musical performances, let the kids run wild in bounce houses and obstacle courses! No need to pack a lunch because 11 different food carts will be happily feeding you including: Jakarta Café, Rib Masters, Kona Ice of Madison, and much more! Celebrate Independence Day in Egg Harbor this year. Hunker down for the Fourth of July parade along Highway 42 and channel your inner Bucky Badger because the UW-Madison marching band will be performing immediately after! Your kids will love seeing all the floats, costumes, and cars. Stop by any of tasty restaurants for a bite to eat and a drink to cool down! View more Wisconsin July 4th Fireworks and Celebrations.